Kyle with the B.F. Day Kids! SMASH Reading at B.F. Day! SMASH artist Kyle Bolton gave a reading for the kids at B.F. Day Elementary School in Seattle. A wild and raucous time was had by all! Obviously the "B.F." must stand for "Bright Future!" 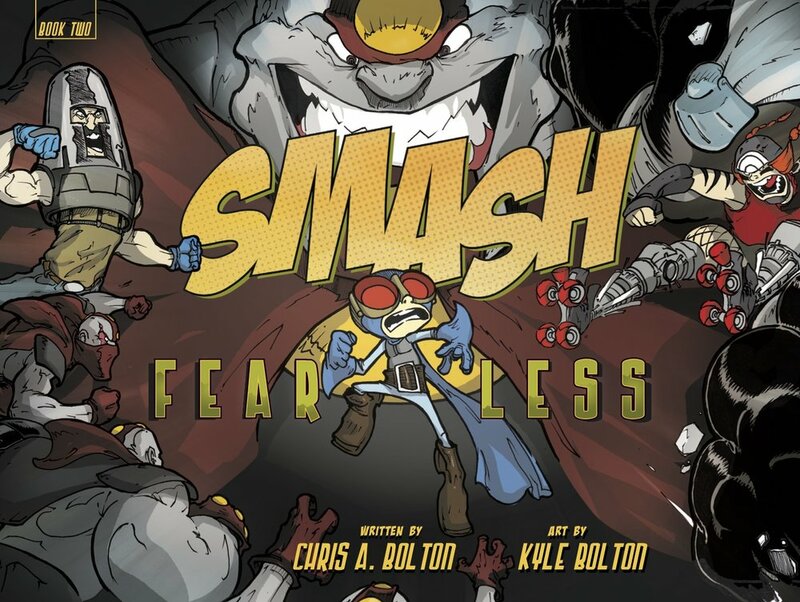 SMASH artist Kyle Bolton paid a visit to the students of Thornton Creek Elementary in Seattle, where he read from Smash Book One: Trial by Fire, talked about drawing comics, and answered questions from lots of 3rd through 5th-grade fans. Huge thanks to Ginny Allemann and everyone at Thornton Creek for such a great reception! This week, SMASH artist Kyle Bolton paid a visit to the 4th and 5th grade classes at Broadview-Thomson K-8 School in Seattle as part of a terrific program called WITS (Writers In The Schools). Kyle showed panels from our book, Smash: Trial by Fire, reading the dialogue and acting out the different characters, and then took a flurry of fantastic questions from the eager students. All eyes were on the author as he animated the story of a ten-year-old boy who finds himself bestowed with superhero powers using a thorough assortment of voices and sounds to match each action. Building up to a critical moment of realization, the entire library gasped when Kyle unveiled the final, "To be continued..." slide of his reading; the cliffhanger was severe, despite only hearing a small part of a story the Boltons have planned to fill five books. The kids sitting around the lingering "To be continued..." slide did not see this as an end but as an opportunity. Their imaginations ignited, when Kyle invited questions, every third hand raised brought ideas for the next four Smash books. Methods for defeating villains, suggestions for co-conspirators, new narrative twists and potential wardrobe ideas were floated for consideration. While it is hard to know which directions the authors might find best suited for the next iterations of Smash, it was clear that no outside distractions were too much for this room full of story tellers, who found new suggestions to share through the end of the hour—ideas that I hope to run into again someday, when these creative students put their pencils to the paper and let the inspiration flow. Huge thanks to WITS and the teachers and students at Broadview-Thomson K-8 School for a great time! If you would like to have the Bolton brothers speak to your classroom, please email us here. You can also find Kyle or Chris via the Society of Children’s Book Writers and Illustrators website. We can't stop singing the praises of Green Bean Books in Portland, Oregon. It's a wonderful children's bookstore — and even though it occupies a relatively small space, it feels like you could be lost for days in there. 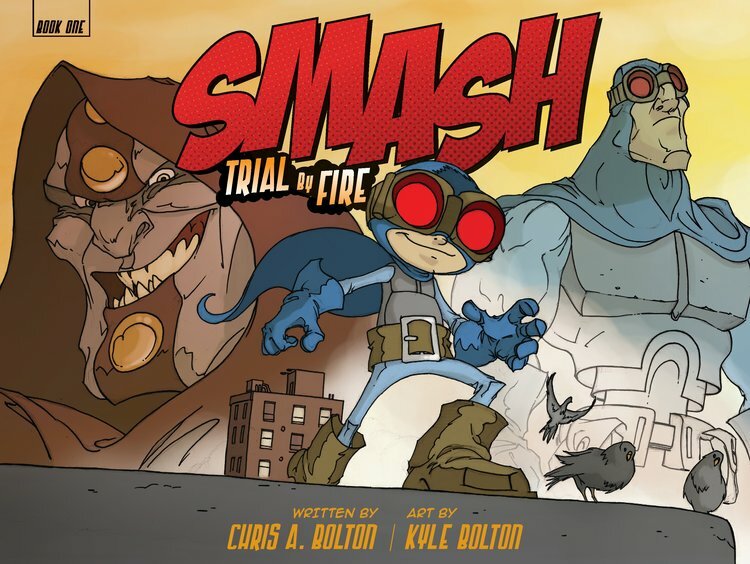 Last Saturday, writer Chris A. Bolton read from SMASH: TRIAL BY FIRE for a bunch of excited kids and eager parents. Kyle couldn't be there to read with him, so Chris's friend (and longtime Smash fan) Craig Fitzpatrick stepped in to provide voices for the Magus, Gareth, and other characters. But they all managed to find a way to share!